Drawn and Quarterly, 9781770461154, 232pp. INCLUDED ON MORE THAN TEN BEST OF THE YEAR LISTS, INCLUDING THE GUARDIAN, PUBLISHERS WEEKLY, SALON, AMAZON, AND THE WASHINGTON POST! The Property is a work that will inspire, fascinate, and delight readers and critics alike. 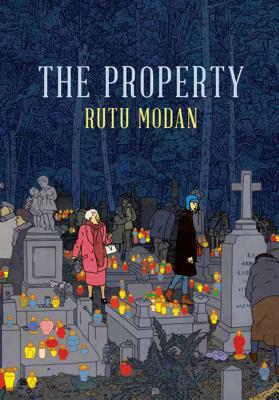 Savvy and insightful, elegant and subtle, Rutu Modan's second full-length graphic novel is a triumph of storytelling and fine lines. After the death of her son, Regina Segal takes her granddaughter Mica to Warsaw, hoping to reclaim a family property lost during the Second World War. As they get to know modern Warsaw, Regina is forced to recall difficult things about her past, and Mica begins to wonder if maybe their reasons for coming aren't a little different than what her grandmother led her to believe. Modan offers up a world populated by prickly seniors, smart-alecky public servants, and stubborn women-a world whose realism is expressed alternately in the absurdity of people's behavior and in the complex consequences of their sacrifices. Modan's ever-present wit is articulated perfectly in her clear-line style, while a subtle, almost muted color palette complements the true-to-life nuances of her characterization. Exit Wounds made a huge splash for this signature combination of wit, style, and realism, and The Property will cement Modan's status as one of the foremost cartoonists working today. Born in Tel Aviv in 1966, Rutu Modan is an illustrator and cartoonist. She cofounded an independent publishing house for alternative comic artists, Actus Tragicus, and has received much recognition for her work, both within Israel and abroad, including nominations for Eisner, Ignatz, and Angoulême awards. Modan has taught comics and illustration at the Bezalel Academy of Art and Design in Jerusalem, and currently lives in England with her family.